I have learned many valuable lessons this week in Chicago, as I do every week. One of these lessons was the importance of taking care for yourself. This week has been filled with surprises, events and activities. As an introverted person, these surprises, paired with the constant hustle and bustle of student teaching in a large urban city, can sometimes seem overwhelming. I realize that by allowing myself time to recharge after a busy week, I set myself up for a better start the following week. After a three day weekend, I was expecting to be gone from my students for a long period of time. As I wrote about last week, it seemed that the student teachers would not be working in Chicago Public Schools this week due to the Strike. However, Columbus Day rolled around and the strike date had not yet been solidified. When I went to bed, there was still no decision about whether the teachers were going to strike. I began, at this point, to realize that the strike may not be the reality for this week. That was confirmed at 5:50 am when my alarm rang loud, signaling the start of a new day. Upon checking the news, I saw that the Chicago Teachers Union and the City of Chicago had a tentative agreement on a contract, there would be no strike. This unexpected, and last minute, turn of events began my week with a rocky start. Though rocky, I would not trade it for anything. Spending time learning about and loving my fourth grade students is the highlight of my student teaching thus far. Each day I cherish the moments I spend with my students. From welcoming them into our classroom at 8:15 am with a smiling face, to laughing with them as they leave at 3:15 pm, and everything in between, my students provide me with comfort. Without the care-free love of my students, this semester would be impossible! With that being said, most of my time on the weekends is spent writing lessons, completing edTPA work, and compiling unit outlines so I can be the best for my students. However, each weekend I chose at least one activity to do around the city. These activities provide a much needed break from the constant work necessary for student teaching. 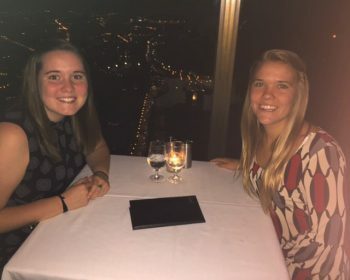 This week, with Monday off for Columbus Day, my roommate Jess and I decided to cross an item off our Bucket List: the Signature Room at The Hancock Center. The Signature Room is an elite restaurant nestled in the 95th floor of the Hancock Tower. Jess and I entered the restaurant hoping to eat just dessert, however unbeknownst to us this is not allowed. 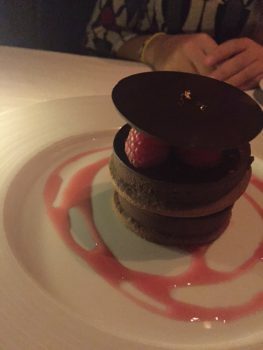 Long story short, we left this restaurant spending 80 dollars for 2 entrees and a shared desert. 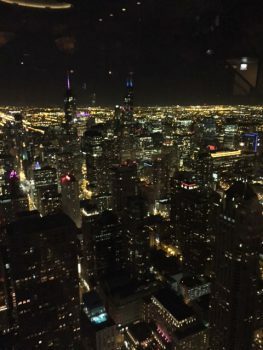 Though shocked, the view of the Chicago skyline was wonderful and all in all the experience was something I will never forget (and likely never repeat). So, don’t be afraid to take some time for yourself. It may help everyone around you.